Made my day finding this message in the dirt! I loved the the stretch from Shelter Cove north. Tons of little lakes, flattish, not hot. I walked into lava fields, which were hot and the footing stunk, but one night I had a perfect campsite on a bluff under trees with a view of the sunset, and also sunrise, both red and brilliant from all the forest fire smoke. A small spring was nearby and I was utterly alone, perfectly quiet. I know a picture is worth a thousand words, but my phone photos of the special Obsidian Area do not capture the glitter of this place. 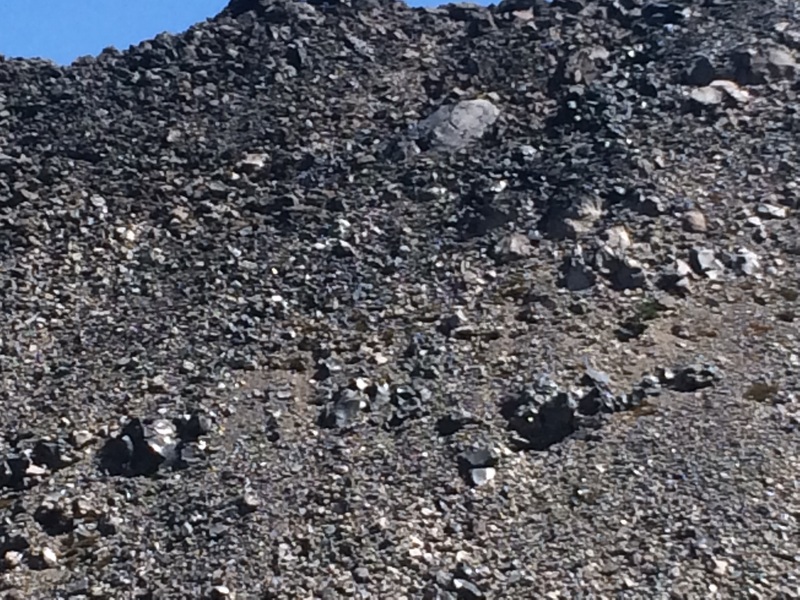 Black obsidian hills and hummocks on a rare sunny day sparkled like crystal shards in a giant garbage dump of volcanic activity. Huge boulders of obsidian, rounded and matte black, were scattered on the landscape as if the old gods had spit out enormous wads of black licorice chewing gum. I wondered about the first people discovering this treasure of tool making materials and what trade routes this stone has traveled. I drank water bubbling from the ground, a spring with arrowhead and axe head sized obsidian rocks piled like scree all around. Were some of the edges chipped and worked by human hands and then discarded, imperfect? 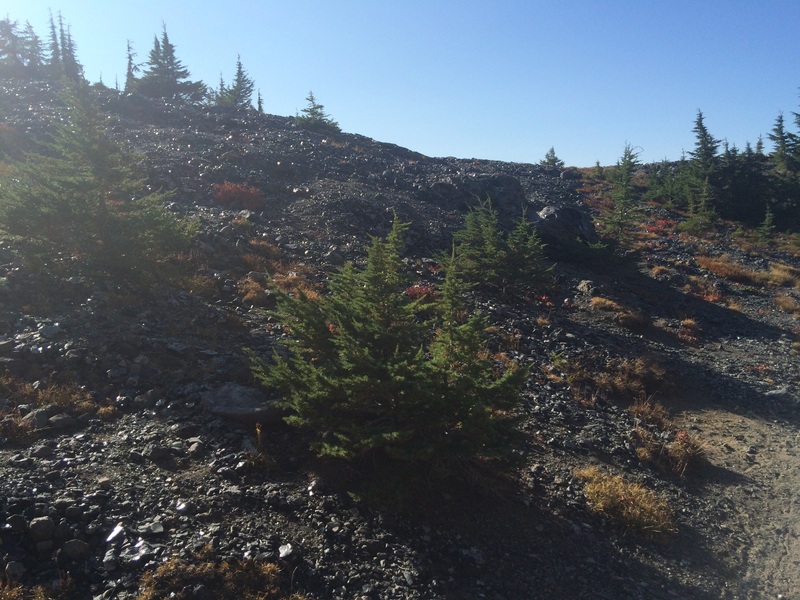 Hiked the following day uphill through massive fields of rotted black lava on a loose, slipping trail of red cinders. As difficult as it was, the unknown trail engineer and construction crew did a stellar job with the alignment and grade. The downhill was horrendous though, with chunks of lava sticking up through a bed of sand and dirt. My friend Tarcey joined me at Big Lake Youth Camp, a 7th Day Adventist camp that has a hiker room, showers, laundry, etc. before mid-August. I got there the day after the last day of camp and it looked like a personnel bomb had gone off. Felt like The Walking Dead were imminent. Got my chores done and Tarcey and I camped a few miles up the trail by a pond. The next days weren’t kind to Tarcey, heat, uphill and bad water tested her limits. She made it though and returned to the area a day or two later to pick me up from the trail and to a motel: shower, laundry, food, beer and battery charging! 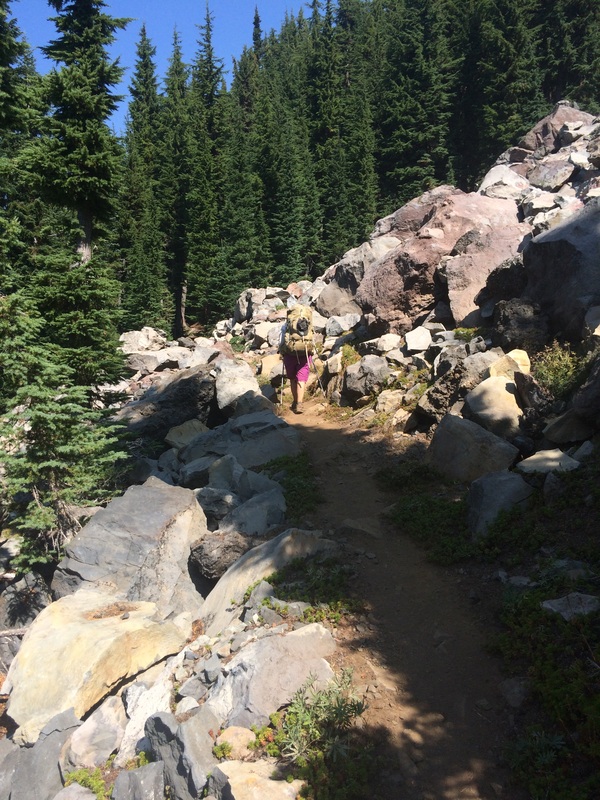 And back to the trail so I could slack pack the last 5 1/2 miles to Timberline Lodge. “0h goddammit,” I yelled as my good ankle rolled on a loose rock, the pain as ligaments or tendons or something wrenched out of place across the bone. I could see my hike ending just as suddenly. I nearly blacked out but really I’d hiked last year on a far more painful injury of my other ankle, maybe the inevitable swelling would allow me to keep walking. RICE is overrated in my personal experience. “2000 miles is all I get?” I limped 3 miles to Ollalie Lake, a mere 13 for the day and considered my options. A day or two off to see how bad it was? A 2 hour hitch to a doctor? I went to the tiny store and bought an IPA, an Ace bandage, a bag of Fritos and 2 Hostess cherry pies. Trail tranquilizers. I took some Advil and camped there. The next morning my ankle was puffy but I could walk without limping or much pain. 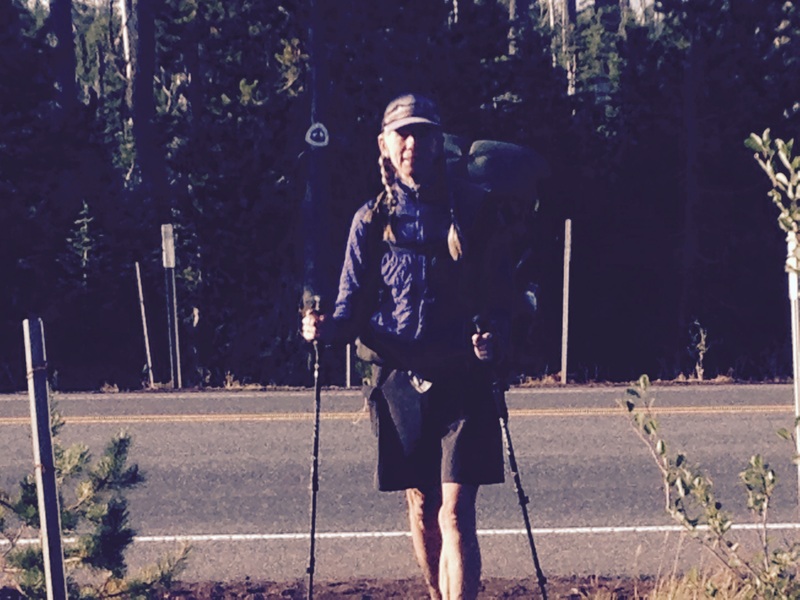 The trail was flat and soft, I camped after 25 miles, about 5:30 to rest the ankle. It’s healing. I’m hiking on. Don’t try this at home. I’m an idiot. I’ve talked about it before, how your perception of time changes on the trail. Time is how many days of food you carry, resupply to resupply, a 100 miles. I think about going from South Lake Tahoe to Sierra City or from Mazama Village to Shelter Cove. On the trail, there’s a daily goal, where’s the next water? Will there be a tent site in 25 miles or should I stop earlier or go later? We ask each other, “Where’d you camp last night?” “Oh, around 1879.” The miles measure time, we hike 2.5 miles to the hour, or 3, we go 10 hours or 12 hours or longer, day after day. Some of us get up early, some get up late and walk till dark, or past. The 100’s just seem to tick by. A hiker will suddenly appear and I’ll have to place him by what mile I saw him last, what place, never what week or day, the weeks and days are anchorless, they don’t attach to miles or resupply locations. The people working in trail towns tease us for never knowing what day of the week it is. We know our start date, we know we’ll run out of trail someday and go back to real life, but for now there is the trail we walk every day, always different, time consuming yet timeless. Very, very deep, poetic, inspirational, and the word images are wonderful. 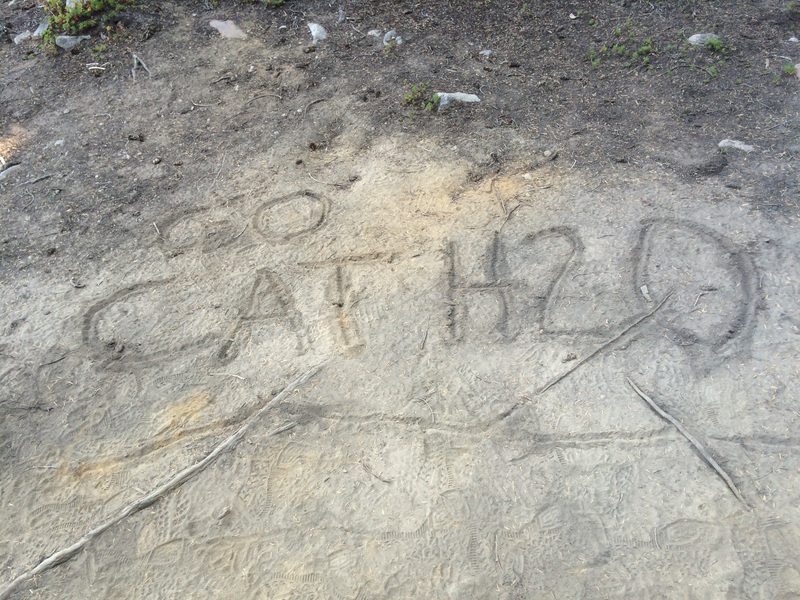 Go Cat H2O! Thank you for sharing your trip. I love your prose, the mixing of physical descriptions and philosophical musings. Hope your ankle heals quickly. I am an inconsistent writer, tough to write these on my phone and self edit. I do love mixing similes in the same sentence or paragraph. 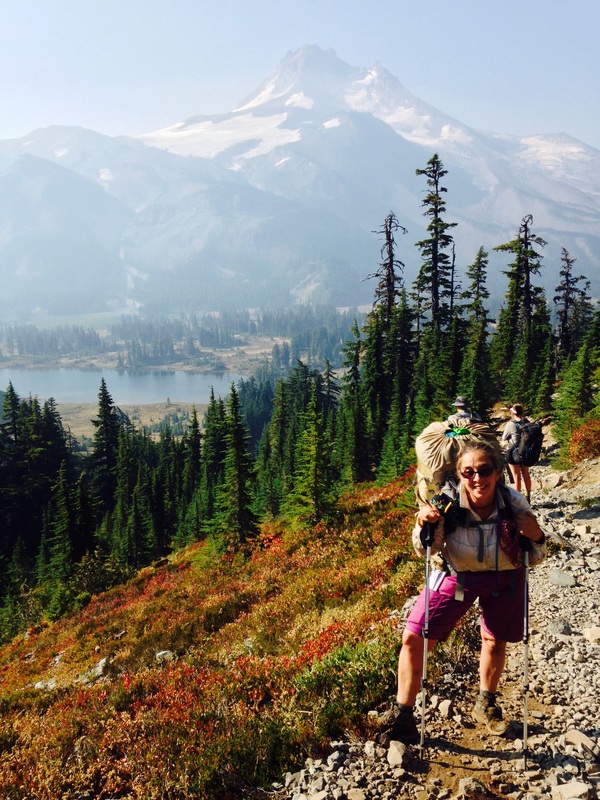 So many of the PCT blogs make the hiker/writer sound whiny and self absorbed. There is that but I try to mix it up a bit. 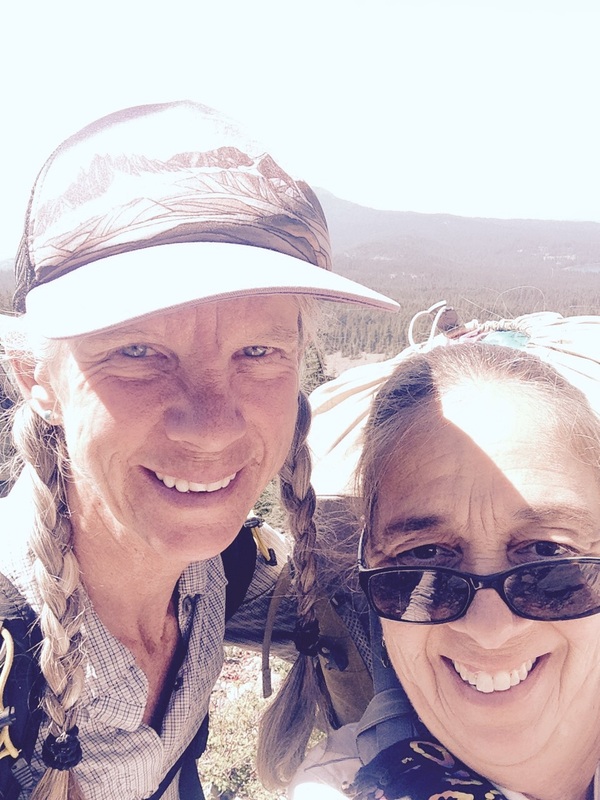 I need to do a catch-up post showing you all a few hiker personalities. There are some unique individuals plodding along with me. You are doing a good job of taking us all along with you. And not really a whine about rolling your ankle especially when the cure is an IPA, Fritos and Hostess cherry pies. Reminds me of my post surfing snack when I was a kid without the IPA of course. That’s the same remedy I use for injury or illness. Have an IPA (or something) and then ignore it and it’ll get better. If it doesn’t go away in a couple of months then it might be ok to go to the doctor. Hope the ankle thing goes away! Go Catwater! PS uh oh. Did you know that if you miss the “w” and get the “e” you get Cateater? Bad!!! thanks for the glimpses into Trail life. Thanks for blogging all of this. I always find myself looking forward to reading your next post! Great writing and super interesting.